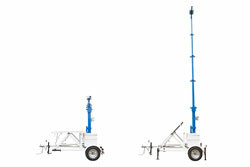 The Larson Electronics RNT-SPLT-.53K-LM30-1XPTZ.20X-CL1B.B-ISGG-TLR10 Portable Solar Surveillance Tower w/ IP Camera provides a safe and effective way for operators to monitor locations from elevated positions between 13.5` to 30`. This solar security assembly features a telescoping tower that folds over for easy transportation, with a rotating boom that allows 360° rotation and a removable mast head for storage when not in use. A full-HD security camera can be used to record images, which is supported by a blue LED strobe lamp that acts as a deterrent. Operators may store footage via a 1TB NVR. This unit features two 265-watt solar panels, a 500aH capacity battery bank with 250aH being usable and a 120V battery charger for powering the cells when sunlight is unavailable, as well as a 7kW backup generator. The RNT-SPLT-.53K-LM30-1XPTZ.20X-CL1B.B-ISGG-TLR10 is a complete, portable solar-powered surveillance system for outdoor and remote locations. This unit consists of a a 13.5`-30` mast, full-HD IP security camera, blue LED strobe fixture, 7kW backup generator and a 1TB NVR. All components are mounted on a single axle trailer. LED Strobe: The RNT-SPLT-.53K-LM30-1XPTZ.20X-CL1B.B-ISGG-TLR10 features a Class 1 blue LED strobe lamp as a deterrent. This compact, high powered LED beacon contains an LED lamp assembly that produces 360° of brilliant blue light without the dark spots or unevenness of traditional incandescent beacon lights. This beacon is equipped with auxiliary LEDs on top, helping to make this a Class 1 rated beacon and capable of producing a brilliant flashing pattern that is visible at extended distances. Trailer Assembly: The entire assembly is mounted to a 10` (trailer length) x 10` (trailer bed) x 14` (tow length), single axle trailer via six 1/2" anchor bolts. The two wheel trailer is equipped with 3,500 lbs axle and leaf springs with 15" trailer tires. 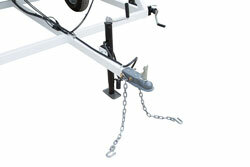 A standard 2" ball coupling, two standard safety chains, and 7-pin flat trailer plug allow for easy hookup and towing. The trailer tongue can be removed for long term deployment. 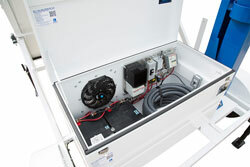 A rugged and waterproof job box is included, safely secured to the trailer. Four outriggers mounted to the corners of the trailer allow operators to level the trailer, and provide stabilization during deployment. All trailer lighting complies with DOT/FMVSS regulations.